terptree celebrates its 12 th birthday! 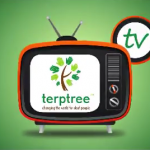 Yes, it is happy 12 th birthday to terptree! From small beginnings in wanting to provide a much higher quality of British Sign Language (BSL)/English Interpreting to now having a huge mission of changing the world for deaf people. Have a look at what we have been up to over these past 12 years. What a 12 years it has been. We continue to be as passionate today as we were back on 20 th September 2006 and have lots more exciting plans for the next 12 years ahead to truly make a difference in the world.